Is a pirate’s life for you? 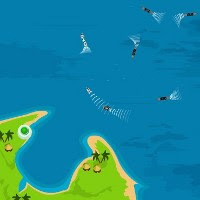 Developer I Play Game’s title, Somali Pirates, let’s you try your hand at a bit of naval subterfuge. Don’t expect to be keelhauling any scalawags, drinking grog, or chasing wenches though; as the title suggests, this game puts you in the waterlogged boots of pirates of a more modern kind. Fans of Jack Sparrow should look elsewhere. The action takes place via a top-down view of the ocean, with a small port in the lower-left corner. Vessels of various sizes will begin to appear, and you’ll need to capture as many of them as possible and lead them back to port for cash rewards. Leading a chain of multiple ships to port will net you extra money. The port itself will shift between “open” and “closed” status, and you can only drop off the captured ships when it’s open. Cruising up next to a ship will begin the capture process. Once the progress bar is full, the ship will follow your pirate boat. NATO warships will do their best to thwart your piratey ways. They can retake ships that you’ve captured by getting close to them, and if your own boat stays next to a NATO vessel for more than a few seconds, it’s game over. Somali Pirates is a simple, high-score-chasing time-waster that’s very simple to play. It’s not going to set the world on fire, but it’s a good way to kill a few minutes of downtime.